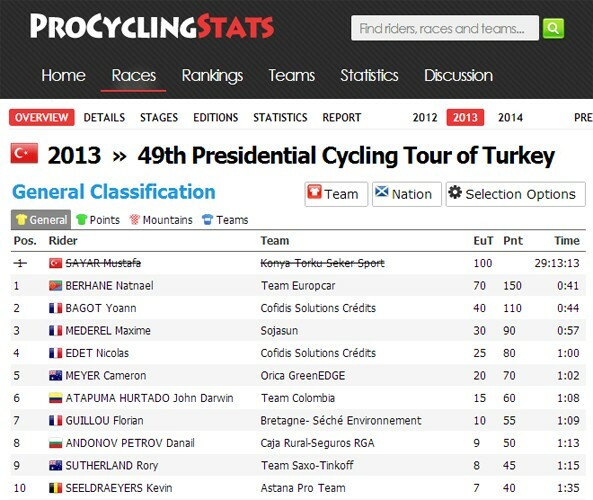 Eritrean Natnael Berhane (Europcar) finally inherited the historic Presidential Tour of Turkey title after Turkish Cycling Federation confirms the doping offence and formally stripped off the victory title from the controversial winner Mustafa Sayar. The surprise victory by a relatively unknown Mustafa Sayar and his dramatic performance on stage six with eight seconds clear of against riders and teams with far more experience raised eyebrows and questions. A provisional suspension later enforced after tests return positive for a banned blood-boosting substance in his urine sample that he gave at earlier race in Algeria. A hearing panel, earlier this month, convened by the Turkish Cycling Federation to conclude that Mustafa Sayar indeed commits an anti-doping rule violation under Article 21 of the UCI Anti-Doping Rules and for that decided to strip off his title and pass it to the next inline, which is Natnael Berhane of Europcar. For this young Eritrean rider, it is an added victory besides what he has just accomplished yesterday at the Tour of Gabon as well as voted African Sportsman of the Year 2013 two weeks ago. Thank you TesfaNews , You ear assume.Congratulation to Natanael Behane and to Congratulate all Eritrean people .Specially to Mekelikal hilitat serawit. I think 2014 belongs to Eritrea in all domains. Eritrea, the land of punt, are full of practical people in general. Nantanel, you gave a big lesson to the whole Africa. Your victories which have been shining in Eritrea and spread throughout Africa. Thank you, you make us so proud. I am confident this historic victories will be repeated in Europe as well. Finally ..A well deserved and earned title and honor to Natu Jegena !!!! Thanks @Tesfanews for the consistent update. Natanel congratulation to you and to all Eritreans cyclist, you make the people from land of hidri to be proud and the land hidri again shining high because of your outstanding performances, Eritrea say you haven't seen the Eritrean youth full potentials yet. As the mine Bisha is the set standard for any furure mines in Eritrea, Natnael Berhane is the measuring steack of cycling proficiency in Eritrea from now on. He is now called the first and only African to win the Tour of Gabon as well as a European world tour as if Africa was waiting for him for the past 65+years. What a pride! We are smiling with pride. Thank you Nathnael. Actually, the corrupt Turkish Cycling federation as the one that has been dragging its feet trying to get away with murder. The man is a cheat. He was a serial abuser of EPO, the same perormance enhancing drug that many other athletes use in order to boost up the efficiency of their oxygen transport into their muscles. The likes of the Multi world tour champions, Alberto contador & Lance Armstrong were amongst the many who Europeans caught with their pants down. Half of Daniel’s Orica Greenedge teammates were also on it for long time but gotten away with it easily. These are a disgrace to the sport that is dying to see athletes like that of the Eritreans win it cleanly. The Turkish cycling federation had finally relented under pressure from UCI. But again, it was an open secret that some UCI officials had long been complicit in assisting big riders with money cheat in the Past. Natanel is a clean winner and he has been confirmed as the winner of the Huete Catagory(2:HC) presidential tour of turkey even before his interview with Tewolde of VOA. I don’t know how Natnael hadn’t been informed of it at that point in time. It was actually a matter if time that there was no way Mustafa Sayer can get away with that. It shouldn’t have taken this long but again, we knew all along that Natnael was the true champion. A birn champion!!!….. A born fighter!!!…. Never give up…..never let his fans down & always dedicating his wins for Eritrea first, his people and then Africa & his team….. Always in that order!!….. He’s a legend and an quality athlete with value……..Never seen anyone like him!!! !……..Daniel is another one but I’m sure the rest of them are the same too…… This patriotic Eritrean athlete has set the bar high……. Next job for Natnael is in another 2:HC race of a gruelling 10-staged Tour de Langkawi in Malaysia at the end of next month. Fellow Eritrean stars, young Merhawi Kudus & and experienced veteran Freqalsi Debesay of MTN Qhubeka will pit against the Europcar star while Daniel will race in a 5 staged tour in Spain to repeat his historic win not far frolicked same race course last year. But before all that, the Tour of Eritrea spanning for 13 days (including 3 days of rest) will electrify the Eri cycling fans back home. It would consist of, amongst others, a 4-staged Zur- Eritrea(tour of Eritrea), a 2 days Fenkil tour in Massawa & a one day road race race in the circuit of Asmara. But sadly, Natanel, Daniel, Merhawi & Freqalsi won’t be able to take part in any of it as they are also booked by their pro teams to compete continents away at almost the same time. However, Jani & Meron Russom of MTN Qhubeka will most certainly be coming home to take part for their pro team but again, these two Eri professional riders know very well that they aint gonna have an easy ride in Eritrea as they had learned a massive lesson during the last National championship of both the ITT & road race. In the road race, both Jani & Meron Russom were sodly beaten by the home based riders while Meron Russom was beaten to second place in the national chronometer championship by the home based Metkel Kiflay while fellow MTN star Jani was also peeped by another home based rider, Tesfom Ukbamariam, to the 3rd place. Tesfom is not only a tough competitor but alSo a home based African road champion taking the continental road race crown from Natnael himself. This proves that there are indeed many more Natnaels back home. In the national road race championship last summer, the biggest national race after tour of Eritrea, it was a home based riders(another two Merons), who shined on the day, taking 1st & 2nd place, followed by Kimdishih Debesay in 3rd place, leaving Jani outside the podium place. Meron Teshome & Meron Amanul. The young home based riders proved that they ain’t an easy push overs. But in this tour of Eritrea series next month, the competition will be tight and tough. Many countries of Africa are expected to also take part in it. But wished the home favourites, Natnael & Daniel were present. Me’Alesh!!!! congratulation Natu Hero Wedi Eri [gegna] for what you did to let Eri on the Top with massive challenge in both tour and proved to all nation we re on the good way ,just we need to be patient to see all the cycling member successful .cheersssssssssssssssssss deki Eri with a lot of love. NATEY ENQUEE HAGOSEKA HAGOSENA ERITRA BDEKKI TEHAGOSIE.